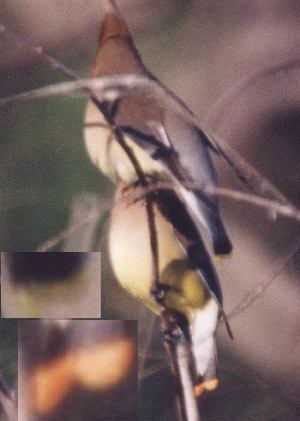 This Cedar Waxwing was photographed at Village Creek Drying Beds, Tarrant County, TX on 1 May, 1999 by Martin Reid. The orange tip to the tail of the lower bird was immediately striking, and it was seen a number of times as the flock of 50+ birds fed in the willows. The Travis Audubon Society web site mentions a report of such a bird, and states that this color is thought to occur when young birds (with still-growing tails) feed on the fruit of Morrow's Honeysuckle, a non-native plant grown in the north of the USA that contains a red pigment called rhodoxanthin. The report says that there are no other records of this rare(?) form from Texas. Interestingly, Morrow's Honeysuckle is native to Japan and the Japanese Waxwing (Bombycilla japonica) has a red tip to the tail (click here to link to a photo) - I wonder if there is a connection? Any comments?